Khadi Natural Kiwi Fruit Lip Balm - Natural Beauty? 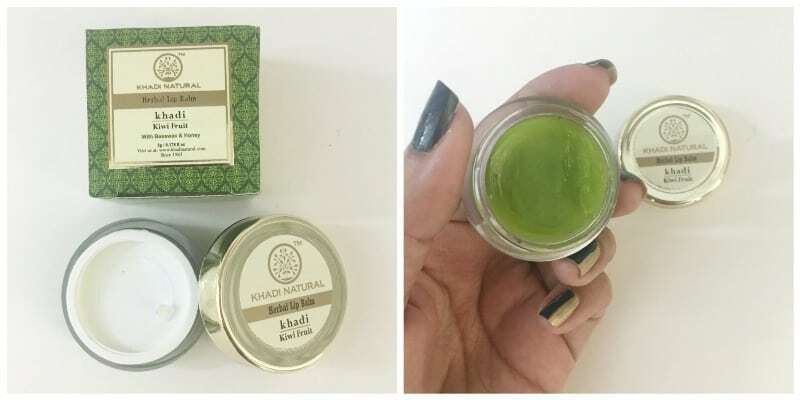 Home ReviewsBeauty Khadi Natural Kiwi Fruit Lip Balm – Natural Beauty? Who is it for? Khadi Natural Kiwi Fruit Lip Balm is for people who prefer natural ingredients in their products. Also, people who like non-tinted balms would like it. This lip balm comes in a small transparent tub with a golden twist to open cap. It has an additional plastic pull to open sealing cap which doesn’t let the product leak. Overall the packaging is travel-friendly. The balm appears green in color but on the application, it does not have any tint. The texture is like petroleum jelly and just a small amount is enough. The fragrance is fruity and hangs on around after applying the balm. This lip balm actually delivers great results. It instantly moisturizes the chapped lips, making them plump and supple. The texture is like petroleum jelly so applying small quantity is enough else, it may make the skin around the lips appear oily. Applying it before a lipstick will heal the chapped and flaky skin on the lips. It is perfect for winters as it will keep the lips moisturized for long. It is non-tinted so applying before a lipstick will not cause a change in color of the lipstick shade. Not tinted, so could be applied before lipstick. Applying in excess quantity can make the skin around the lips appear oily. Yes, its delivers great results. Perfect for chapped and flaky lips. Its something thats affordable with perfect result and comes from a trusted brand !